On the back of its new activity wearable (see below), TomTom has now given its motorcycle sat nav range a similar makeover and the results could change how you navigate the roads on two wheels. The updated Rider range, which includes the Rider 42, 420 and the 450, enables bikers discover the most exhilarating new routes for all their journeys. These 150 routes, curated by MotoPlus, Adventure Bike RIDER, Tourenfahrer and others come together with lifetime world maps, live traffic and speed camera alerts. 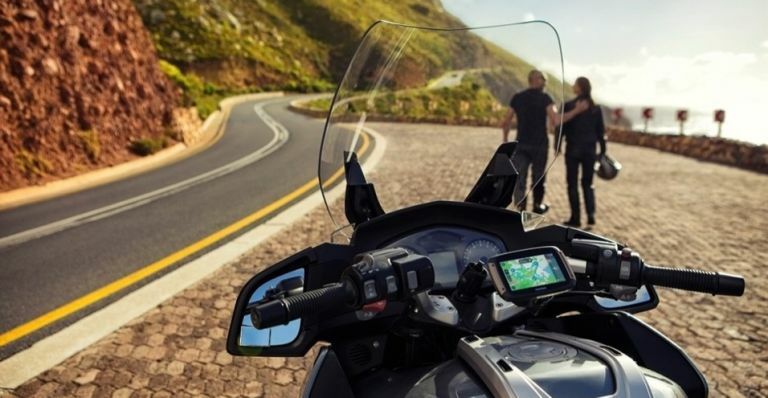 The entire TomTom Rider range has also been upgraded with a touch sensitive screen that adapts to light and heavy gloves, for easy use no matter the weather conditions. The entire range will be available to buy from 25 April. You can pre-order each one directly from TomTom with the 450 retailing for £349.99, the 420 will come in at the same price and the 42 will cost £299.99. Rolex sister company Tudor has confirmed its new Black Bay 41 watch will be arriving in the Europe and the UK later this month - complete with a stylish redesign and a wealth of strap options. The Black Bay 41 offers the same level of quality craftsmanship as the rest of the Black Bay range, but with a few extra subtle tweaks. Its dial and sapphire crystal are both flat as opposed to the domed ones founds in the rest of the family. The dial boasts a lacquered glossy, dressier finish to it while the other Black Bays are fitted with mat domed dials. Last but not least, the Heritage Black Bay 41 has a polished, fixed stainless steel bezel, smartening up the very sporty look of the traditional Black Bay rotatable bezel. The Tudor Black Bay 41 will be retailing at £2,000 on steel bracelet and £1,790 on a brown leather strap. Both options come with a complimentary camouflage fabric strap. Swedish developer DICE has opened up for a number of behind closed doors play sessions with its Star Wars Battlefront sequel and the news is looking very promising. Along with a brand new single-player story (something the first game was sorely lacking), Battlefront 2 will see hero and vehicle pickups dropped in favour of system similar to that used in Battlefield 1. That WW1 shooter inspiration goes further with DICE confirming the combat model won't be as approachable as the first, with weapons such as blasters taking far longer to master. This kind of depth is far more in line with DICE's previous Battlefields and a welcome change to the shallow combat that made the first Battlefront so hard to stick with months after its release. Star Wars Battlefront 2 will arrive this November on Xbox One, PS4 and PC.